Among 8,000 mosques, there are 5 oldest mosques in Russia. The number of oldest mosques in Russia comes from the fact that Islam has been in Russia since the mid of 7th century AD. This makes Russia be a home for Muslims. Twenty percent of its population are Muslims. Below are 5 oldest mosques in Russia. People also pronounce Marcani as al-Mardjani. Marcani mosque is in Old Tatar Quarter of Kazan, precisely at the bank of the lake Qaban. 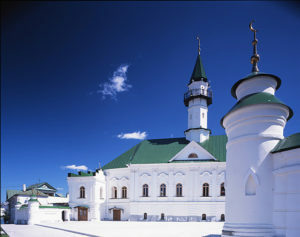 In addition to be one of the oldest mosques in Russia, Marcani is also the first Cathedral mosque. Catherine the Great’s authority built it in 1766-1770, following persecution toward Russian Muslims. The funds came from donations raised by Kazan’s people. 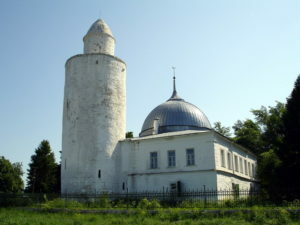 Marcani mosque represents a typical Tatar mosque as it has Tatar medieval architecture. It also has baroque style that was happening at that time. Moreover it has two stories and two halls. The mosque got its name from the name of Şihabetdin Märcani who had become Imam in the mosque since 1850. In 1861, merchant I. G. Yunisov donated some money to build additional stairs. He made another donation in 1863, in which the donation was used for extension of mihrab and the breaching of new windows. In 1885, merchant Z. Gosmanov donated some funds to renovate the minaret. Moreover, merchants W. Gizzatullin and M. Walisin had the tracery balcony added to the minaret in 1887. 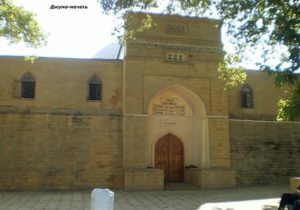 Khan’s mosque is considered as the oldest mosque in Central Russia. Russian people built it between 15th and 16th century. According to Kadir Ali, Shahghali built the brick mosque sometime in the mid of 16th century. However, some others believe that the mosque goes back to the reign of Qasim Khan. That’s how the mosque got its name. In 1702, Peter the Great ordered his people to tear down the building. However, its wide stone minaret survives until now. Russian Muslims built the existing mosque next to the old minaret in 1768. Several local Tatar nobles donated some money to build the second story in 1835. There is also another local landmark Shahghali’s Mausoleum which is a little closer to Oka River. Russians built it in the mid of 16th century. Minaret of the mosque has minimalist design. Along with its unadorned walls, the minaret reminds of that of the famous Guangta Minaret of Huaisheng Mosque in Guangzhou, South China. The Khan’s Mosque has become a public museum since 1930’s. 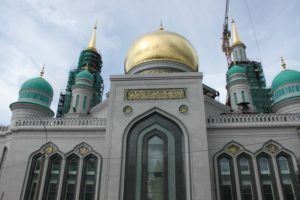 In addition to be one of the oldest mosque, Moscow Cathedral mosque is also the biggest mosque in Russia. People also call it Central Moscow mosque. The mosque’s minarets are 79-meter high. This makes them the tallest among mosques’s minarets all over Europe. The color of gray is the majority color of the walls. The construction finished in 1904. In 2011, Russian government demolished and rebuilt the building. After they rebuilt it, it becomes 20 times wider than the previous one to accommodate up to 10,000 people. Moreover, it has seven elevators and air conditioning. For added convenience, they also built facilities for disabled people. The reconstruction required $170 million. Russian businessman and senator Suleyman Kerimov helped by donating. The money also came from Palestinian leader Mahmoud Abbas on behalf of Palestinian children. The reconstruction also included covering the dome and pavilions with 12 kg of gold. Then, the work finished on September 23, 2015. People built the Old Mosque in 1823. People built the Old Mosque to replace an earlier private mosque after fire burnt it down in 1812. 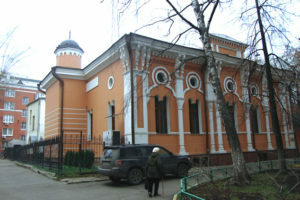 The mosque is in Bolshaya Tatarskaya street in Zamoskvorechye on a land owned by Tatar merchant Nasarbai Hashalov. The construction was according to the permission of Tsarist authorities. The authorities stated that the construction of a “Muslim house of prayer” had to follow certain conditions. Those conditions were: 1) it should not have facade that significantly differed from surrounding houses and 2) people should not call it a “mosque”. Thus, the construction was performed under those conditions. The first mosque did not have cupola nor minaret. In 1880, people added those exteriors. Following the construction, people had built Islamic-based schools since 1915, so Moslem children can learn there. In 1939, however, Soviets ordered to stop any activities in the mosque. In addition to stopping any Muslim activities carried out in the mosque, they destroyed the minaret. They also banished the imam of the mosque. People did not go to the mosque until 1993. In that year, people rebuilt the minaret that the Soviets destroyed. As Juma Mosque is an ancient mosque, the color of its wall is mainly brown, without any bright color. It is 28 meters and 68 meters in length. However, the survived mosque has a bad history. In 1930’s, people shut down religious buildings during anti-religious campaign. Moreover, unlike other religious buildings, Juma Mosque was used as prison from 1938 until in 1943. Then, it becomes a mosque once more. Those are 5 oldest mosques in Russia. You can also check out History of Muslim culture. So, which one that you want to visit the most?